Bake My Day! : Where to start? Hmm I guess I forgot to tell you that I wasn't going to be around for a while. Tired of that lonesome crab quiche yet? I should warn you to brace yourself, I've spent the whole morning (in between washing, folding, vacuuming, clearing mess and cleaning) at my laptop trying to sort out all the photo's three tireless travellers made in ten days. And if I am going to try and post only half of the stories I gathered and only a percentage of the photos.....you're in for a very busy blog. It all started on a Saturday, by making trip to Amsterdam to collect two ladies and their luggage....only a few small bags. I didn't know what to expect when we walked into the hotel lobby, surely not one blogging lady in yoga position on a couch... I bit my lip and asked (head upside down) eeeh Sue Cooks Wild Sue? And from the corner of my eye I saw this other blogging lady unfolding herself...My Kitchen in Half Cups Tanna? Nothing better than speaking upside down to break the ice. The first laughter was on it's way. We negotiated Amsterdam traffic (taxis and eeh..bikes, I will let someone else explain) to find ourselves a place to have coffee and chat. Time to pile into the car and get home. The kids were looking forward to meet "the English ladies without husbands". Don't ask. English? The weather was beautiful so after having a tour of the house we were back in the garden with wine and water. And since I am very very organised and planned this wonderful 5-course dinner meant to be served inside on fresh white linen with napkins and crystal... I decided there and then that we would stay outside and served appetizer and first course all together on large plates in the garden. I guess that above anything I am flexible and not sticking to an agenda (::cough::). Really girls, I do have napkins, linen, crystal, candles and stuff although you haven't seen any of it. Ahum. So much for planning. Oh and look, I even got a crash course napkin folding from Tanna! Already the garden was filled with lots of chatter and laughter, my dinnerplans collapsed as the twins went to have dinner at a friends house instead of staying home, and I spontaneously invited Floris' friend for dinner in their place. In between unwrapping presents and sipping Gratien & Meyer Cremant we all went inside the kitchen to arrange the bites on plates. All hands on deck and I guess that was a preliminary of how the week was going to be. Kitchen, garden and dinner table heart of the matter. Chatter and laughter all around. A very good sign of things to come! Sue and DH in the kitchen. For dinner I tried to make a compilation of blog-bites and Dutch originals. Appetizer should have been buckwheat pancakes, spread with wasabi sour cream and smoked salmon cut into little slices. That was going to be followed by a rectangular dish with three bites: puffs filled with shrimp and a little sweet pepper-flavoured cream cheese, a cherry tomato "burger" with basil and buffalo mozzarella cheese sprinkled with balsamic and lemon oil, and piquant peppadew peppers filled with honey-flavoured cream cheese. Well .... it all ended on a large plate for all of us to sample. Assembling buck wheat crepes. Then we had a creamy roasted yellow bell pepper soup with some fresh baked semolina bread. To proceed with a very Dutch main course: White asparagus with two types of ham (smoked Italian and cooked Dutch), boiled and crumbled eggs with hollandaise sauce and new small potatoes. I got the asparagus from the farmers market and they were really wonderfull, white asparagus that squeak when rubbed together are a sure sign of freshness. And still even more presents to unwrap! All of us got fabulous gifts (I began to understand what was in all these bags! ), we -and I especially- felt very pampered! All the boys were very happy with their T-shirts and had some stories to share in class Monday morning, wearing their new shirts of course! Can't wait to tell you about the magnificent cookbook Tanna and Sue brought me and , and, ... so many stories to tell! What a beautiful post! It brought back memories of our first evening together at your lovely home! All of the food was delicioius and the atmosphere in your garden was lively and fun!! Thanks again to you and your family for being such gracious hosts to the 2 "English Ladies"!! 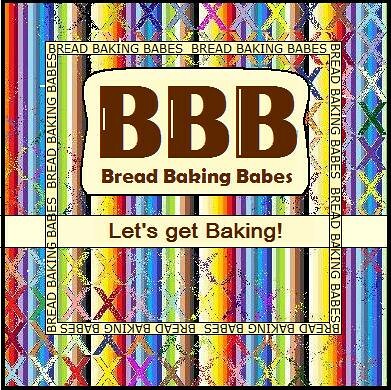 And I can truly say that you are the "Bread Baking Goddess" of all time!! Never have I seen or eaten so many beautiful breads -- all made by your hands! Incredible! Thanks again for everything! Gadfry, there you are so way far ahead of me but my clothes are now in the wash! And I've had 8 hours sleep. I'll second the "Bread Baking Goddess" title (easy to show with all those flicker photos). Upside down and with gargantuan luggage and no flowers, we still got the warmest of welcomes imaginable. Fabulous breads, wonderful bites, a lovely garden, gracious hosts, delightful boys, a kitchen ringing with laughter, what would we need with crystal? Thanks for making that pond so much smaller! Next time I'm gonna be a part of this. I loved reading about your meet up, just how I imagine it to be when a few good blogger buddies get together! Everything sounds lovely--what a great time--and I loved that you were cool on the fly and served dinner outdoors. To me, that's the mark of a really good hostess. Hope you're getting some rest now! oh how nice it all sounds! I'm happy you had such a good time together! Thanks for all your sweet comments, and Tanna & Sue you were the most wonderful guests to have in our house. Meeta, you're invited, next time you'll be part of this!